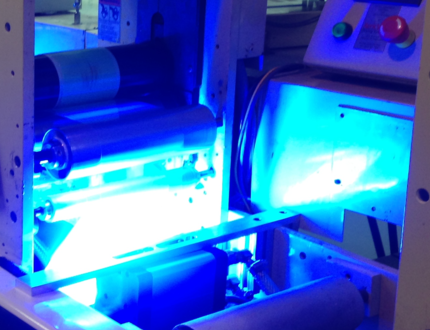 UV Printing refers to a commercial printing process that uses ultraviolet curing technology. Also known as Ultraviolet Printing, the UV Printing process involves special inks that have been formulated to dry quickly when exposed to ultraviolet (UV) light. As the paper (or other substrate) passes through the printing press and receives wet ink, it is immediately exposed to UV light. Because the UV light dries the application of ink instantly, the ink does not have the opportunity to seep or spread. Hence, images and text print in sharper detail. The ink is dry the second it comes off the press. No time is lost waiting for the ink to dry before folding, binding, or performing other finishing operations. Works with a variety of materials, including paper and non-paper substrates. UV Printing works particularly well with synthetic paper, a popular substrate for maps, menus, and other moisture-resistant applications. UV-cured ink is less prone to scratches, scuffs, or ink transfer during handling and transportation. It also resists fading. The printing is sharper and more vibrant. Because the ink dries so rapidly, it does not have a chance to spread or absorb into the substrate. As a result, the printing stays vivid and crisp. The UV printing process is kinder to the environment. Because UV-cured inks are not solvent-based, there are no harmful substances to evaporate into the surrounding air. If you have any questions, or have an upcoming project that would benefit from UV printing technology, give Formax a call at 866-367-6221. We can UV print your project in sizes up to 27” x 39”. If you already know your project specs and would like a quote, click here to submit our easy quote request form. As always, we look forward to assisting with your printing needs! Related Article: What is UV Coating?